Thank you for servicing my sewing machine so well. My Janome is operating so smoothly, it is a pleasure to work on. I picked up my sewing machine from your shop yesterday, after your positively excellent work? I just thought of writing you this email to let you know that I tried my machine today, and to my surprise, I have to admit, it is even sewing better than when I just got it brand new 35 years ago. I remember I had problem with sewing some T shirt like material because it would skip, and to get a continuous line, I had to put paper underneath the material to prevent it from skipping. Today, I tried my machine with the same material and NO NEED FOR PAPER any more. It sewed beautifully. Thank you for encouraging me to keep my so called old machine, rather than spending another hundreds of dollars on a new machine which would not have been made as well as these old machines to begin with. I thank you and appreciate your valuable service and extremely reasonable fees. Just to let you know, I am delighted with the work you did on my machine. Once I found a belt you took it to a new level of performance and I think you have an artisan’s touch! “Yes! It is fabulous – as you said – better than new. Very happy and happily sewing. Thank you sew much! Here is an example of some of my work. Thanks so much, Wei Hin! Once again, my Pfaff is purring, thanks to you. I’m a repeat customer because I value your honesty, straight-forwardedness, expertise and skill. I trust what you’re doing. You’re dependable and friendly. I appreciate the time to take to show me and explain to me what needs to be done and what you did. I’m happy that you are willing to work on my older machine (a grad gift from 1977!) and keep it in great running condition as long as possible. And, your prices are reasonable. I’d highly recommend you in a nano-second to anyone who needs their sewing machine tuned up or repaired. Given your wait list, I know that many others have already found you! Congrats on providing such a high quality service! I’m very grateful for what you do and happy that you love what you do! It’s obvious. I’ve spent six hours each yesterday and today at my studio with my 1473. If I didn’t recognize the marks on my machine, I would think you switched my machine for a newer one! What a joy to sew on! No loose rattly bits on the front, the engine is so smooth,and everything is running so well. Thank you again for your careful attention and thoroughness. I am so delighted to have found such a professional :). You repaired my old Husquvarna sewing machine for me this summer. I hadn’t had an opportunity to use it until the last two weeks. It works beautifully. It hasn’t worked so well in years. Thank you so much for your professional work and the advice you kindly gave to me about use when I picked it up. Hi Wei Hin…I hope you had a great time in Ontario and found lots to enjoy in that part of the country. I am late in thanking you for restoring my little Pfaff machine to its former glory. I was so glad that you were able to service it before you left…and I have had it humming ever since. No more noise, no binding of threads, breaking of needles…you are a miracle worker. Please don’t ever retire as I’m never trusting my “work horse” to anyone else ever again. I wanted to say how much I appreciate your service on my Bernina 440. I noticed the difference in my machine immediately when I set it up. Thank you wei. You did an excellent job and I am so glad that I went to you to have my machine serviced. I cant praise you enough. Wanted to Thank You for fixing my machine (Bernina -830). It works fantastic (better than new)! I will certainly recommend you to any one who needs machine repairs. I love the work you did on my Janome 5018. With the walking foot on (and some strong polyester thread – it was only a few short seams) I was able to use it like an industrial machine. I had to make a foot drop splint out of neoprene, and Velcro. Wei has done an excellent job repairing my 20+ years old Pfaff machine. It sews like new again! I highly recommend Wei’s service, because of his skill and attention to detail, and also because his estimate of time and cost of the repair was very accurate. I had a chance to sew with my Pfaff 1209 that you repaired recently and I just wanted to thank you again for doing such a wonderful job on the machine. It runs like new and sews so smoothly… just as it did 35 years ago!! 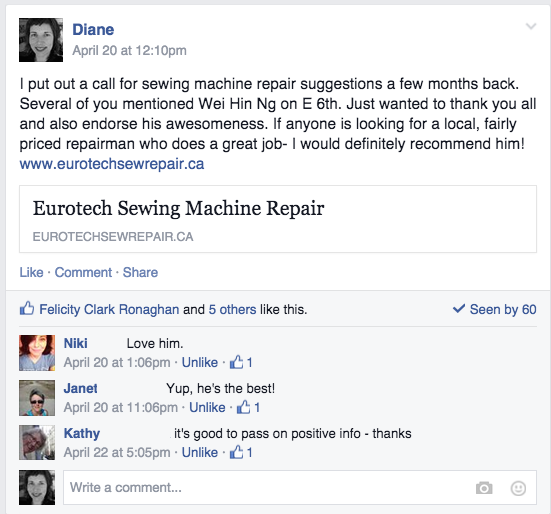 I already referred someone to you and will definitely refer anyone who needs their machine serviced in the future. Just wanted to thank you for the machine, it’s working beautifully better than when it was given to me. Will take good care of it. I wanted to thank you for your professional superb servicing of my Janome Memory Craft 7000 and my old Singer feather weight. In the past I have not had my machines serviced because I knew no one who I could trust. I love my machines! Thank goodness my drive belt broke and I was forced to go to you. Otherwise I would never have found a man with the experience and talent to service my machines – you! Being a professional seamstress I normally use industrial machines but my domestic machines do so many things you just can’t do on an industrial. I depend on my domestics for these functions and each one you have touched work better than when I bought them. That says a lot.